You're currently viewing posts by Pinsider Medisinyl. 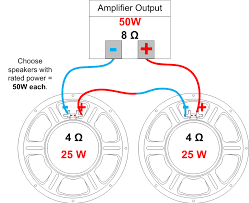 Not something I've done on a pinball machine (so perhaps take this with a grain of salt [I have done many car/home stereo installs]), but from what you mention, I would use two 8-ohm speakers and wire them in parallel (like #1). That should offer better power from the amp than two 4-ohm speakers wired in series. Two 8-ohm in parallel gives you 4-ohms, while two 4-ohm in series would be 8-ohms (the lower the ohms, the more wattage you'll get from the amp, but as you note, not all amps can handle that). As I expect the audio is mono anyway, I'm not sure if it could potentially be better to fit a slightly larger, single speaker instead at 4-ohms? I'm saying that two 8-ohm speakers IS a 4-ohm speaker (in parallel), which would be optimal if you must use two speakers. Two 4-ohm speakers will result in either 2-ohm (parallel) or 8-ohm (series). 2-ohm possibly doing damage, and 8-ohm drawing less wattage from the amp. Right i get what your saying now. Makes sense as i looked at my souther park and it have 2 8ohms speakers wired in parallel.